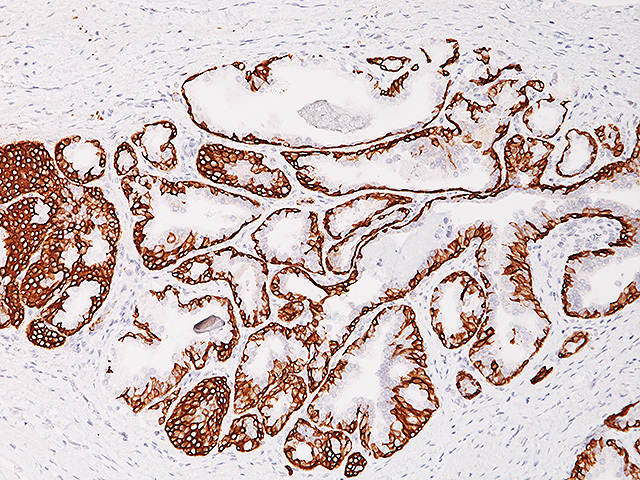 The CK5/CK14 monoclonal antibodies have been shown to be superior to CK5/6 and 34βE12. 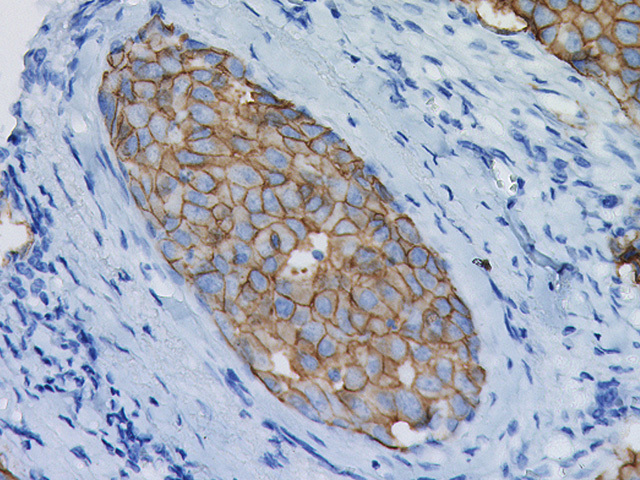 Cytokeratin 5/14 antibody may be used to identify basal cells in prostate and myoepithelium cells in breast cancer. Loss of epithelium staining along with p63 typically occurs in PIN (prostatic intraepithelial neoplasia) and prostate cancer. Additionally, CK5/CK14 + AMACR (P504S) may be added to the panel of antibodies used to assess neoplasia in prostate biopsies. Studies have shown that CK5/14 positive sporadic breast cancers arise from glandularly committed progenitor cells and represent about 9% of sporadic invasive ductal breast cancers and 78% of BRCA1-associated tumors. 1. Abrahams NA, et al. Validation of cytokeratin 5/6 as an effective substitute for keratin 903 in the differentiation of benign from malignant glands in prostate needle biopsies. Histopathology. 2002 Jul; 41(1):35-41. 2. Shah RB, et al. Comparison of the basal cell-specific markers, 34betaE12 and p63, in the diagnosis of prostate cancer. Am J Surg Pathol. 2002 Sep; 26(9):1161-8. 3. Bhargava R, et al. 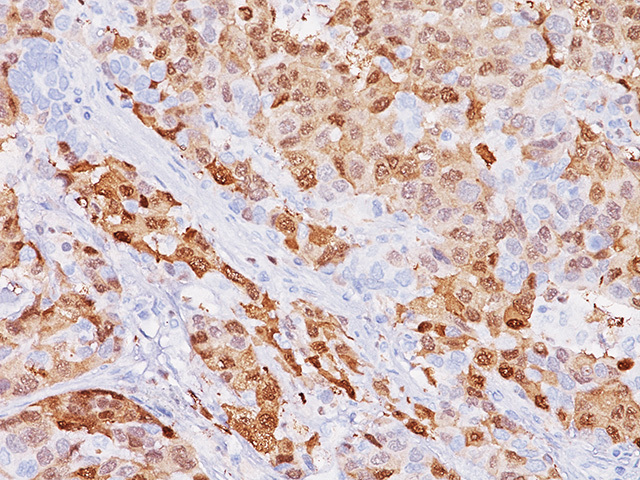 CK5 is more sensitive than CK5/6 in identifying the “basal-like” phenotype of breast carcinoma. Am J Clin Pathol. 2008 Nov; 130(5):724-30. 4. Reis-Filho JS, et al. Distribution of p63, cytokeratins 5/6 and cytokeratin 14 in 51 normal and 400 neoplastic human tissue samples using TARP-4 multi-tumor tissue microarray. Virchows Arch. 2003 Aug; 443(2):122-32. 5. Laakso M, et al. 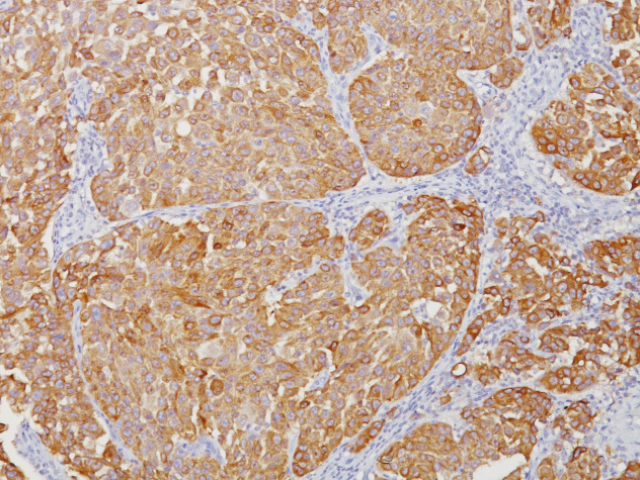 Cytokeratin 5/14-positive breast cancer: true basal phenotype confined to BRCA1 tumors. Mod Pathol. 2005 Oct; 18(10):1321-8.